Filed to: remember your first kiss and how bad it was?Filed to: remember your first kiss and how bad it was? remember your first kiss and how bad it was? Tubelip wrasses live on coral reefs stretching from the eastern coast of Africa to far-flung atolls in the South Pacific. They get their name from their bizarre lips, which are conspicuously curled, making them look like someone glued a PVC pipe onto their face. 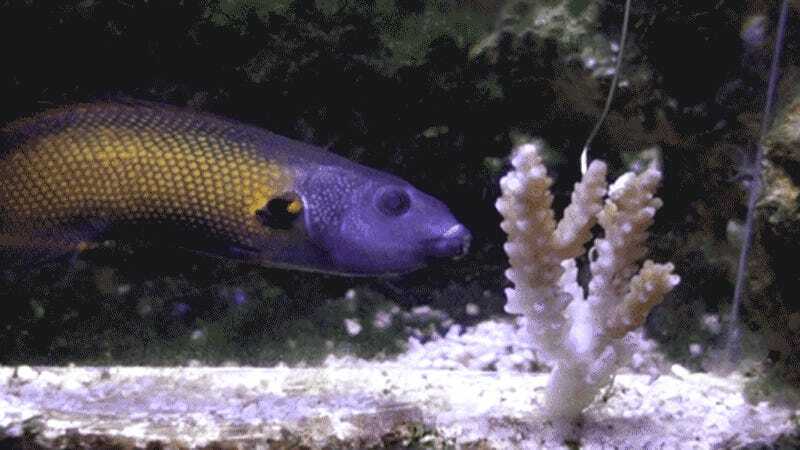 It’s these lips that allow the wrasse to feed on their favorite food—coral—and scientists have only now detailed how in a new paper in the journal Current Biology, revealing a strange predation mechanism never before described by science. The technique basically involves vanquishing food with a slime-slicked, World’s Worst First Kiss, over and over again. Coral is an abundant food source on coral reefs, but the stuff isn’t exactly easy to eat. Corals are made up of multitudes of tiny polyps, and each one—like their jellyfish cousins—has a prickly, venomous sting. What little flesh exists continually excretes a film of mucus. To make things worse, the hard, aragonite skeleton of coral is brittle and sharp. Trying to eat a coral is like trying to eat a slippery, ceramic cheese grater that also hates you. Unsurprisingly, most fish opt for less complicated meals: Of the thousands of species of coral reef fish, only about 130 of them dare to dine on coral. More than half of these coral-eaters are butterflyfish, which nibble and peck at the reef. Others, like pufferfish, chomp on coral like it’s rock candy, pulverizing it by the mouthful with powerful, beak-like teeth. However, the tubelip wrasse has evolved corallivory down to an art, and unlike all other coral connoisseurs, there’s no munching or crunching required. It all comes down to those lips, which are the most highly-specialized tools found in reef fishes for om-nom-noming on coral. The perpetual pucker is thick, plushy, and extends over the teeth, in stark contrast with their closest relatives, which have thin, retracted lips and protruding teeth. But the lips get even weirder when you zoom in. In their new study, researchers used scanning electron microscopy to get detailed images of the outer surface of the kisser of the southern tubelip (Labropsis australis), revealing a previously unknown and striking feature. The lips are extensively covered in lamellae—thin, tightly stacked ridges or plates of tissue—giving them a deeply grooved or flaked appearance. In biology, lamellae often exist to create a lot of surface area for copious mucus production, and so too it seems for the lamellae-laden lips of the tubelip. This nasty little Nemo might have a diet made up almost entirely of coral boogers, made possible by its own lip boogers. The researchers took cross-sections of the folds and found they were packed with mucus-producing goblet cells. The resulting slime coating on the fish’s lips is key to how it feeds. When one of these affectionate eaters forcefully smooches a coral, the lip slobber likely has a dual function: The snotty barrier makes much of the polyp’s aggravated stinging fruitless, and it helps make a suction-producing seal on the coral’s own lubricated exterior. Video footage of the tubelip wrasse placing a few wet ones on coral shows it sucking up bits of the coral’s yummy mucus and tissues. The researchers note that the fish like to target damaged, mucus-dumping areas of coral—a hint that they may primarily live on coral goop rather than the polyps themselves. Yes, this nasty little Nemo might have a diet made up almost entirely of coral boogers, made possible by its own lip boogers. Science is just now getting acquainted with the tubelip wrasse’s gross, uncomfortably tender eating habits, highlighting how much we still don’t understand about coral reefs—and how much we stand to lose in the wake of widespread coral bleaching and death. It’s no secret that coral provides critical habitat for reef animals. But plenty of creatures have even more intimate relationships with coral, like the tubelip. Many butterflyfish are ‘obligate corallivores’, meaning that they eat only coral, and often only a select few species. The harlequin filefish (Oxymonacanthus longirostris), prune at Acropora corals partially to absorb their scent, helping them chemically blend in with the reef to avoid predators. If the coral goes, specialized animals like these go with it.